The editors of the encyclopedia have employed well-known standards of style and usage in an effort to maintain conformity in the contributions of scholars who represent more than one academic tradition. 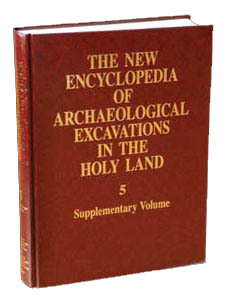 For the sake of consistency, spellings utilized in the previous four volumes have been maintained, including the transliteration of Arabic place names. For the transliteration of Hebrew place names not appearing in the Bible, we have followed the system developed by the Academy of Hebrew Language (Jerusalem); for biblical quotations and the spelling of personal and place names appearing in the Bible, the Revised Standard Version of the Bible. Foreign terms that have been adopted into common English usage appear in roman rather than italic font. q.v. (quod vide, or which see). This abbreviation directs readers to another entry containing particularly pertinent information or, in some cases, to another discussion that amplifies a technical point. In survey articles, q.v. indicates those sites for which there is a separate entry. ()  … Used in the body of an inscription, these symbols indicate, respectively, a suggested reconstruction, missing letter(s) or word(s), or an incomplete text. A dot above a letter in the context of an inscription indicates that the reading is uncertain. Map Reference Numbers. A table has been provided indicating the map reference numbers of the sites. The map coordinates for the New and Old Israel Grids are included, according to the grid system established by the Survey of Israel. Site Survey Numbers. Survey numbers appear in certain entries that refer to as yet unpublished survey maps. Their inclusion is intended to facilitate research once the maps become available.